It all started with a red paperclip. 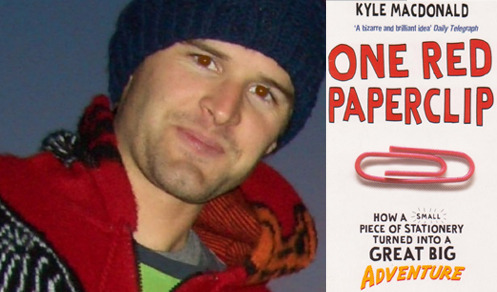 On July 12, 2005, Kyle MacDonald, posted a picture of a red paperclip on his blog and in the barter section of craigslist and asked if anyone wanted to make a trade with him for something bigger or better. A few days later he traded the paperclip for a pen shaped like a fish. Then he traded the pen for a doorknob. And so on, each time trading for something bigger or better. After 14 trades he finally wound up with a house! Along the way he went on to win some great media attention, wrote a book about the adventure, went on to hold a Guinness World Record for the Most Successful Internet Trade, got featured in TV shows, shared stage with celebrities and even had commercials shot based on his story! All because of one red paperclip and a bit of weird ingenuity! The highlights of his ‘journey’ were made available live via a dedicated Twitter Feed, YouTube Channel, Instagram channel , facebook page and PR all tied in to a well designed website. Stats like Josh Sankey’s real time location, the number of bacon blocks he had left with him, the bacon exchange rate at any given point in time were all made available through the site lending the campaign a very realistic feel. After a couple of days he succesfully completed the drive from NY to LA and pooled in interesting (and in many instances very realistic) accounts of his ‘bacon barter’ across the country. And from the looks of it, this seems to have been a very successful and an innovative launch campaign for the brand in the States. While I must admit that this execution lent itself to the idea of Heineken Opening Your World, it definitely lacks the feel of realism and drama that Oscar Mayer managed to capture through its ‘BaconBarter’ campaign. For starters, what are the chances that in the inner Mangolian region, while wandering along some random fields you stop a tractor chugging along and successfully manage to make a barter deal with the locals by communicating in just English? Nevertheless, it was very interesting for me to discover these 2 campaigns being executed along very similar lines (at around the same time) while also comparing and contrasting their executional specifics. Which execution did you like? This entry was posted in Uncategorized and tagged Bacon Barter, Guinness World Record, Heineken, Heineken Passpport, Josh Sankey, Kraft Foods, Kyle MacDonald, One Red PaperClip, Oscar Mayer, Volkswagen. Bookmark the permalink.